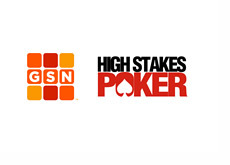 The third episode of "High Stakes Poker" Season 6 aired on GSN earlier tonight. 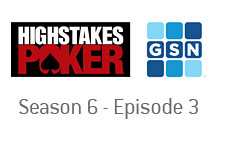 The starting line-up for this week's episode was: Gus Hansen, Daniel Negreanu, Phil Ivey, Tom Dwan, Eli Elezra, Dario Minieri and Antonio Esfandiari. At the end of last week's episode, we learned that Jason Mercier would take the place of Andreas Hoivold in this week's episode, and that Tom Dwan and Daniel Negreanu would get into an all-in confrontation. Phil Hellmuth was quickly dispatched in the first episode of Season 6, while Andreas Hoivold hit the rail in episode 2. Would another player meet a similar fate in episode 3? At this point, Jason Mercier sat at the table, and immediately decided to raise holding pocket Twos. Tom "durrrr" Dwan put in a re-raise holding A-3 offsuit, and Mercier elected to make the fold. Phil Ivey took down pot #5. Ivey, who held pocket Eights, decided to call a Gus Hansen bet after a flop of 5h-Js-Jh. The turn brought the 5c - Hansen bet again, and Ivey called again. The two players checked the river, and Ivey took down the pot (Hansen held A-K offsuit). Mercier and Minieri then split a pot when both players flipped over A-J after checking down on the river with the board reading J-Q-10-3-2. Gus Hansen then won a 60k pot with Ace high on a board of 7d-Jd-Jh-2h-7h. Negreanu, who held 9d-8d for an inside straight flush draw, called Hansen's turn bet and then both players checked it down on the river. Eli Elezra then won the biggest pot of the episode ($210k) after getting into a confrontation with Gus Hansen. Hansen, holding 6s-4s, bet on every street, including a $62k bet on the river, which Elezra called (board read Ks-9h-3d-3c-As). Elezra flipped over Kh-8h, and Hansen mucked his hand, unable to execute a successful bluff. Elezra won the next pot as well, a 30k pot in which he called Esfandiari's river bluff with Ace high on a board of 2c-5h-4s-Kh-5c. Elezra's Ace high was good, and he won another pot. Jason Mercier then won a small pot off of Negreanu after he flopped a King high flush. Negreanu bet out on the flop holding just a pair of Eights, Mercier raised, and Negreanu folded. The final hand of the episode was the all-in confrontation between Negreanu and Dwan. There was over 35k in the pot when the flop came 4s-9h-Jd. Ivey (who held pocket Eights) checked, as did Negreanu. Dwan bet $18,200, Ivey folded, Negreanu pushed all-in and Dwan snap-called. The players decided to run it twice. Dwan won the first deal (2h-Jc), but Negreanu was able to spike trip Nines on the second deal (Ac-9c) to split the pot.